It happens almost every session I do. I briefly get self-conscious. There’s a moment when I’m not sure where to go, what technique to use, or what approach might work. It reminds me of one of the first session I ever did. I’ll call the client Bill, and he came to me for help visualizing. Then, he explained why. I’d just recently opened up my office and BIll was one of my first clients. It turns out that Bill had been to seminars by all the biggies in the field. He’d been to some of the early NLP seminars in the ’70s with Bandler and Grinder. He’d participated in workshops with Dilts, done the Tony Robbins thing and a lot more. And he’d been doing it for a long, long time. Bill told me that when he’d been doing exercises in all these classes, he wasn’t much able to visualize. He felt a bit like a fraud, even though he’d been to many of them and was quite knowledgeable. So, here I was, a newbie, trying to help a guy who, honestly, had more experience than I did. Plus, he’d sat in the room with the biggest names in the biz and still hadn’t licked the problem. I remember swallowing hard, and having one of those “Oh, crap. What do I do.” moments. Like I say, it happens to one degree or another, most every session. But this one was particularly intimidating. “I know one thing I can do. I can ask him more about what he wants to accomplish.” So, I asked him for more details about his goal to be able to visualize more easily. As Bill began to speak, I began to notice things. I noticed where his eyes went, what words seemed to have the greatest emotional impact, how he gestured when he talked about certain things, the change in emotion and pitch in his voice. And I noticed something else, as well. When I checked in with myself, the nervousness was gone. But why was it gone? Well, I’d slipped into what’s called uptime trance, for one. Uptime trance allows me to work intuitively, but still be alert and responsive. I use it when I do sessions, or speak in front of a group. I think the biggest factor, however, was the direction of my attention. All of my attention was outward, in all channels. You see, in order to be anxious, self-conscious, or nervous, you have to be thinking about the possibility of something bad happening. You might be visualizing it or talking about it. That causes you to feel the feelings of nervousness, as if the bad things were actually happening. Self-consciousness is essentially a self-centered activity. By that, I mean that your attention is centered on yourself. And guess what? When your attention is toward yourself, it’s not on the other person. It’s hard to be a good therapist when you’ve got all your brain’s processing power pointed at what you’re doing. Looking at it more precisely, in that scenario, we’ve got both visual and auditory channels filled up with data about ourselves. It’s hard to do two unrelated things in one channel at once. Just try listening to one song, while humming another! And so, in order to be good at your job, you turn your attention outward. And, since your audio and visual channels are busy with outside data, there’s not near as much energy devoted to thinking about yourself. Self-consciousness goes away, in large part. 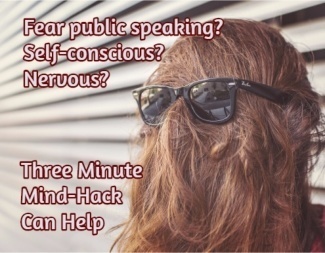 Now, some people who work with fear of public speaking, tell you to imagine the people listening in their underwear. Well, that’s taking an internal imagination and pointing it to some other internal imagination. And that’s perhaps a step in the right direction. But I suggest we go a little forward and turn our visual channel outward. One way to get better at this is to practice going from internal orientation to external. Just sitting in a room, by yourself, you can practice checking in with yourself and how you’re feeling. You can talk to yourself about that and imagine what you must look like from across the room. Then switch to an external orientation. Notice a few things around the room, visually. Notice the contrast between light and dark. Pick a color and notice where it occurs in the room. Then, switch to sound. Are there any background noises? What does it sound like when you snap your fingers? Then, practice with people. Again, start with yourself. When you move to external, notice their posture and breathing. Pay attention to the way they move, the tone of their voice, the rhythm they use when they speak. Notice their expression, where they look and their gestures. As you get better at external orientation, you’ll be able to bring it on at will. You can create an anchor for it, if you know how. Then, the next time you even start to feel self-conscious, turn the external orientation on, and see what happens!